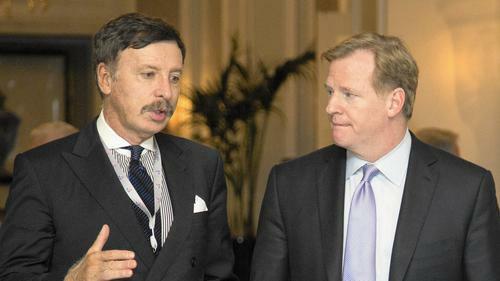 Rams owner Stan Kroenke has been given the nickname of “Silent Stan”, for his quiet demeanor (especially when compared to other owners in the NFL). However, despite that moniker, Kroenke has made plenty of noise throughout the past year, over the possibility of moving the St. Louis Rams back to Los Angeles. It’s been a controversial that’s been heating up with each passing day. Even Patriots owner Robert Kraft believe there will be “two teams in Los Angeles in 2016”. The Rams aren’t the only team engulfed in the discussion of moving to Los Angeles. The Oakland Raiders, who are owned by Mark Davis, and the San Diego Chargers, owned by Alexander Spanos. Recently, the annual NFL owners’ meetings concluded, and among other controversial issues, the topic of the NFL in Los Angeles was brought up. It was at the meetings where Kroenke revealed his stadium plans more visually. He revealed that the $1.86 billion venue in Inglewood he plans to have built isn’t just a one-team stadium. The NFL has made it clear they’d want two teams in the L.A market, and that’s exactly what the stadium in Inglewood could do: hold two NFL teams. This proposal has caught a lot of people’s attention. It’s been known for weeks that the Raiders and Chargers proposed a joint plan to share a stadium in Carson, California, which is 13 miles south of downtown Los Angeles. With the City of St. Louis proposing their own stadium plan, it creates even greater conflict. NFL commissioner Roger Goodell has stressed to the three teams and their owners that before they jump on the wagon and head on down (or west) to L.A, they attempt to work things out with the cities they are currently in. “San Diego has been working 14 years on a new stadium. Oakland is not in a new debate either, for the A’s or the Raiders,” Goodell said. In addition to the criticism Kroenke has received in regards to his approach and actions involving the Rams’ possible move to Los Angeles, he has also received criticism and warnings about his proposed stadium. The AEG report, who commissioned a study by former Secretary of Homeland Security Tom Ridge, had stated that not only would the stadium be 3-4 miles from Los Angeles International Airport, but it would be beneath the flight path of airliners, which, in Ridge’s mind, could lead to a “terror event”. But, there were those who disagreed with the report, namely experts in the field of aviation, as well as Los Angeles city officials. All of these arguments, controversies, and issues, all tie into Stan Kroenke’s plans to build a stadium in L.A, which would most likely mean the Rams would leave St. Louis. The issue of bringing the NFL to Los Angeles again is far from over, but one thing is for sure: for an owner who doesn’t say much, he sure is making a lot of noise.